A diverse workplace has several benefits to a business, such as a variety of solutions to company issues and insight into international markets during expansion. But the language barrier that can sometimes occur in a diverse workplace, or any workplace, may become a communication problem. There might be language barriers between people of different ethnic backgrounds, people of different ages and people with different levels of industry experience. Any language barrier is going to slow communication or create misunderstandings that make communication ineffective. Effective communication in a workplace is based on professional correspondence designed to assist in the daily operation of the company or the continued growth of the organization. When employees allow personal issues to affect company communication, a communication problem develops that could take a long time to track down and resolve. People who refuse to communicate based on a personal disagreement are damaging the company’s ability to do business and slowing the growth of the organization. One-way communication can become an ineffective way to exchange information throughout the company. Employees and managerial staff should provide feedback at all times to improve the quality of information disseminated and the manner in which the information is delivered. For example, if a department tends to send out information in a format confusing to other people in the company, then that department needs to be informed of its communication problems immediately or else the information coming from that group will always pose a communication challenge. When new employees are brought into the organization, they need to receive a comprehensive introduction into the proper ways to communicate throughout the organization. Companies that do not include communication training in their new-hire orientation programs will be forced to struggle with new hires that are forced to learn proper communication procedures by a process of hit and miss. Long custom lines, parking problems. 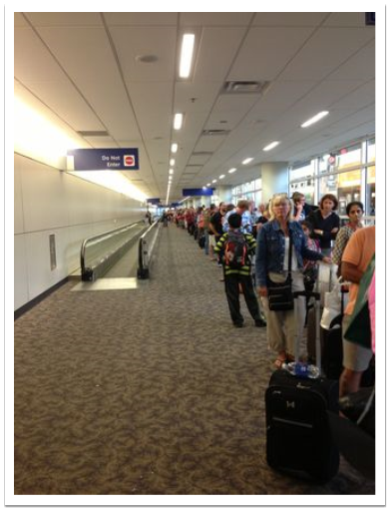 Passengers are not happy to stay in a long line buy their tickets they want to tack there tickets as soon as possible. Also the lack of parking spaces. Ability to give what exactly customer need. Overweight baggage, Liquids include, Cabin baggage restrictions, Locked suitcases are some examples regarding extra baggages. Anyhow if passenger want to take the baggage’s passenger will have pay extra money to take those extra baggages. Sometimes large families come to the airport at the last moment and hard to check because they are in a rush to get on-board and the other massive challenge was sitting them all together. Looking after special peoples such as elders, walk aid, etc. How you would handle a PRM onboard. 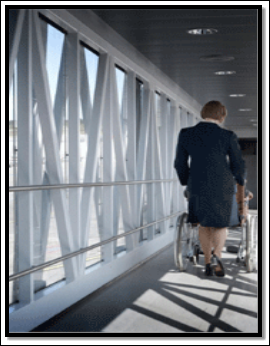 It is the responsibility of the airport to assist disabled passengers and passengers with reduced mobility. If you have reduced mobility, the airport will provide you with assistance within the terminal buildings, car parks and other public areas. If needed, airport will also assist you with check-in, security check, and border control, moving around the gate area and boarding the aircraft. A person with reduced mobility (PRM) is defined as any person whose mobility is permanently or temporarily reduced due to physical incapacity (sensory or locomotory), intellectual deficiency, age, impaired vision or hearing, or other cause of disability that means they require assistance at the airport when travelling. Assistance services are free of charge for PRM passengers. If you require, an assistant will come and meet you when you arrive at Airport. Alternatively, you can also go directly to the check-in desk. If you need assistance, report to one of the pick-up points marked with the international disabled access symbol at least two hours before flight departure. There is a dedicated check-in desk at the Airport for passengers needing assistance. The desk is labeled “Special Passengers” and is marked with the corresponding international symbols. If passenger wishes, staff will assist you all the way from the check-in desk onto the aircraft. If passenger requires special assistance, passenger will be allowed to board the aircraft before the other passengers, so that the staff can ask about the needs for in-flight assistance and more easily assist the passenger onto the plane. Passengers with reduced mobility will primarily be seated by the window. Airlines do not supply assistive devices, such as elevating seat cushions, so you must be able to sit in a regular aircraft seat. If passenger requires help in taking medication, eating, visiting the toilet, getting up or communicating, you must be accompanied by a personal assistant. When passenger arrives to the destination, passenger will be met by a member of staff, who will provide all the assistance need to continue your journey. If passenger needs help to disembark from the aircraft, this will happen after the other passengers have left, so that we have more space and time to assist the passenger. After disembarking, passenger will be assisted all the way to your next mode of transportation (a connecting flight, car, taxi or bus). How a passenger can request for WCHR from his selected airline. Are passengers who can negotiate steps and move about in the aircraft cabin but who need a wheelchair or other assistance to move between the aircraft and the terminal building or within the terminal itself and between arrival and departure zones in the terminal. Eugene W. Anderson. “Customer Satisfaction and Word of Mouth.”Customer Satisfaction and Word of Mouth11.3 (2013): 1-10. Print. Dr Stephen Goodwin. “The Journal of Consumer Satisfaction/Dissatisfaction and Complaining Behavior will beholding its biennial conference .”The Journal of Consumer Satisfaction/Dissatisfaction and Complaining Behavior will beholding its biennial conference15.6 (2014): 5-8. Print. David Lewis. “Customer Satisfaction.”Make Hidden Persuaders Work for You: Aroma, Music, Color, Font Read more: http://www.marketingprofs.com/articles/2014/24995/make-hidden-persuaders-work-for-you-aroma-music-color-font#ixzz31svhR6q21.1 (2014): 1. Print. Marisa Currie-Rose. “Website Satisfaction By Google Consumer Surveys”analytics.blogspot.n.p., n.d. Web. 11 May 2014. No name. “Customer Satisfaction”https://www.surveyshare.com/templates/.n.p., n.d. Web. 2014 Nov 14. "Challenges of Customer Service in an Airline Industry." UKEssays.com. 11 2018. All Answers Ltd. 04 2019 <https://www.ukessays.com/essays/aviation/challenges-of-customer-service-airline.php?vref=1>. "Challenges of Customer Service in an Airline Industry." All Answers Ltd. ukessays.com, November 2018. Web. 19 April 2019. <https://www.ukessays.com/essays/aviation/challenges-of-customer-service-airline.php?vref=1>. UKEssays. November 2018. Challenges of Customer Service in an Airline Industry. [online]. Available from: https://www.ukessays.com/essays/aviation/challenges-of-customer-service-airline.php?vref=1 [Accessed 19 April 2019]. UKEssays. Challenges of Customer Service in an Airline Industry [Internet]. November 2018. [Accessed 19 April 2019]; Available from: https://www.ukessays.com/essays/aviation/challenges-of-customer-service-airline.php?vref=1.